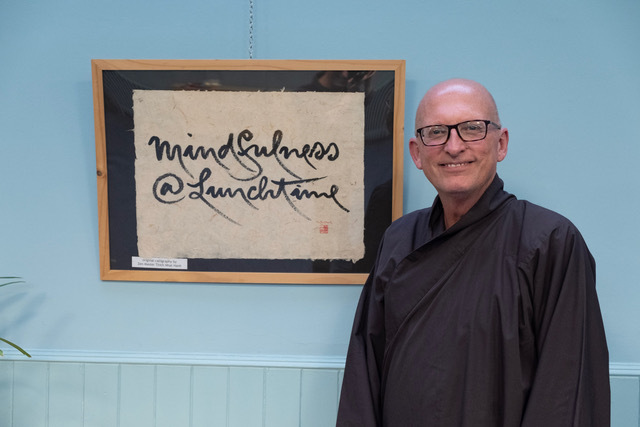 Br Phap Vu, a senior monastic in Thich Nhat Hanh’s Sangha, was guest at Mindfulness@Lunchtime and he also gave a talk ‘Mindfulness in Every Day Life at St Mark’s. You know you are in Edinburgh when you attend Mindfulness@Lunchtime at St. Mark’s Unitarian Church. Every Tuesday for about the past ten to fifteen years urban dwellers of Edinburgh (Edinburghers) have had the opportunity to stop and enjoy a bit of mindful practice during lunchtime. The weekly event is a collaboration of the Wild Geese Sangha in the tradition of Plum Village and the Unitarian Congregation of Edinburgh, and of course the lunchtime practice is open for anyone who is interested. Knowing that I was going to be in the area, Jon Bagust, the creator and facilitator of Mindfulness@Lunchtime, asked if I would be willing to facilitate a session. I had facilitated once before a few years ago at the invitation of Jon and knew what a terrific event it is – how could I refuse. Between 12:30 and 2:00 every Tuesday the doors of St. Mark’s is open for a schedule of mid-day practice. One just needs to bring their lunch and their mindfulness. The Lunchtime event begins with sitting mediation and walking meditation from 12:30 to 1:15. At 1:15 to 1:40 there is eating meditation in silence. After the meal at 1:40 to 2:00 there is another session of sitting meditation. What makes this schedule so accessible to the urbanites of Edinburgh is, I believe, two things; first, it is in the heart of Edinburgh; second, you don’t have to attend the whole thing. The Mindful Lunchtime schedule is set up so that anyone can join in at any of the practices. If you can’t make the sitting, fine, join in for the meal. If you can’t stay after the meal, great, enjoy the rest of your day. I think that Mindfulness@Lunchtime must be one of the great secrets of our time because I am really surprised that this idea and expression of the practice hasn’t spread to other urban areas. In any event, the idea and the mindful energy of Mindful Lunch is there for you to eat up – bon appetite! Do you have a green space in your lives; a garden, a window box, a sea view? How is your green space special for you? Alastair Moodie explores Judaism, Jesus, and Christianity. A 7 part meditation on gratitude lead by Jon Bagust. If we can not be happy in spite of our difficulties - what good is our mindfulness practice? Almost exactly two months after The Referendum has a bit of the dust settled on the political, economic and community stability situations? A guided meditation in 6 parts - A mountain meditation written by John Kabat-Zinn lead by Reverend Maud Robinson. This will be Rev Maud Robinson’s final service as minister with the Beloved Community of Unitarians in Edinburgh. 21st May is Lailat al Bara'a - the Night of Forgiveness - when Muslims pray and ask God for forgiveness for their sins. Whether one involves God or not, asking for and giving forgiveness are important spiritual practices for all of us. Today sees a happy coincidence of Buddha Day, celebrating the enlightenment of the Buddha, and Pentecost, celebrating the spiritual inspiration of the apostles of Jesus. Can we find common themes in the two feast days? A brief reflection on what it means to be a member of a Unitarian community. The General Election - how should we, as Unitarians, respond? Considering some of the issues around religion and politics, especially when faced with a ballot paper. How can the themes and reflections of the Annual Meetings of our General Assembly impact on how we think and act here in Edinburgh? This service also includes some words of tribute to Adam Bojelian, a member of St Mark's and a talented poet, who died in March 2015, aged 15 years.